Despite the pictures in this post not being super pretty or all that great, I still had to share. 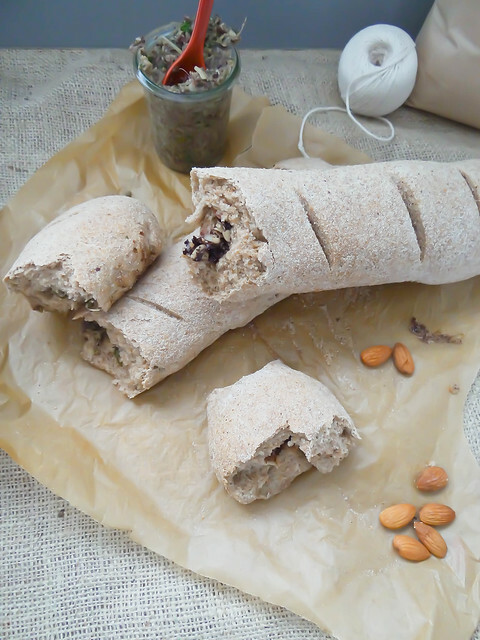 You know, how could I not share a recipe for chocolate almond stuffed baguette or the most amazing olive & artichoke stuffed baguette. Come on people - bread and chocolate? I think so, it would be a crime not to share this with you. The baguettes are made with 100% stone ground organic NH Wheat (bread flour)- I think that make by why they didn't brown the way I had hoped. I never thought I would find NH made flour, the farmers market that I have recently been stalking frequenting on the weekends carries locally grown and processed organic whole wheat pastry and bread flour. 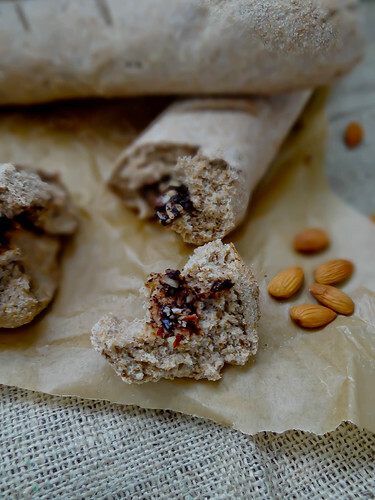 This flour is rustic and amazing! 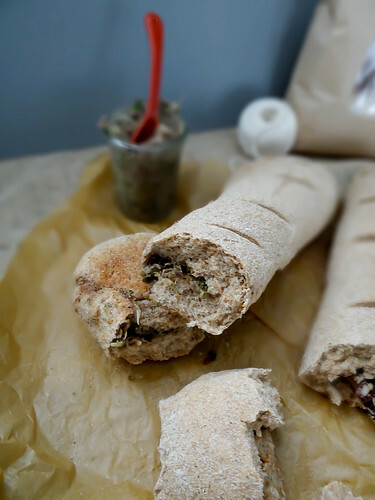 This recipe makes 2 baguettes - I opted to make one savory and one sweet. Certainly feel free to make one or the other, a mix of both or plain. Your call, but I certainly was happy to have both to enjoy over the weekend. Justin preferred the savory and I loved them both. Add 3 cups of flour plus salt & agave to the yeast mixture - with a gentle hand mix with a wooden spoon until a dough ball begins to take shape. Turn dough onto a lightly floured surface, a 1/4 cup at a time knead remaining flour into the dough until dough becomes smooth and elastic - about 8-10 minutes. Oil a Medium bowl and place dough ball into bowl turning over once to coat with oil. Cover with plastic wrap or a towel and allow to rise in a warm place free of drafts until doubled in size- about 1 hour. Punch dough down and allow to rest for 5 minutes. Turn dough onto a lightly floured surface and divide into 2 equal pieces. Working with 1 piece at a time, covering the other piece with a towel or plastic wrap to prevent drying. Flatten dough ball into a rectangle, spread either the sweet or savory mixture down the center of the rectangle leaving about a 1 inch border at each end - enclose the filling by forming dough into a baguette, pinching the bottom seam to seal. Repeat with the other piece of dough with the alternate filling. 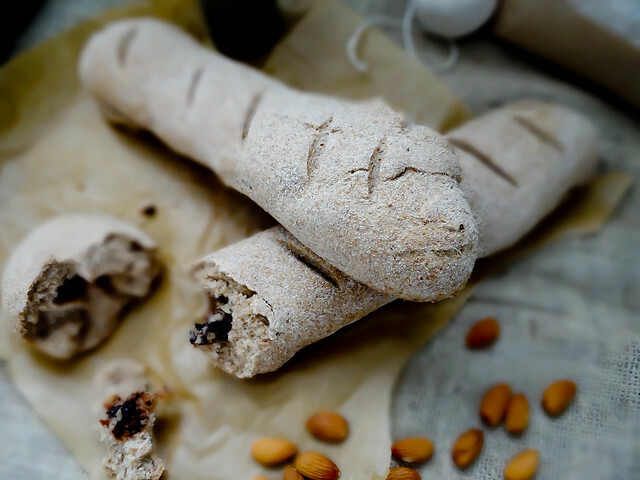 Place formed baguettes on a parchment lined baking sheet. Cover and allow to rise until doubled in size - about 30 minutes. Pre heat oven during the second rise. Bake the baguettes for 15 or until bottoms are golden brown and bread sounds hollow when tapped from the bottom. Remove from oven and allow to cook for at least 10 minutes until slicing. 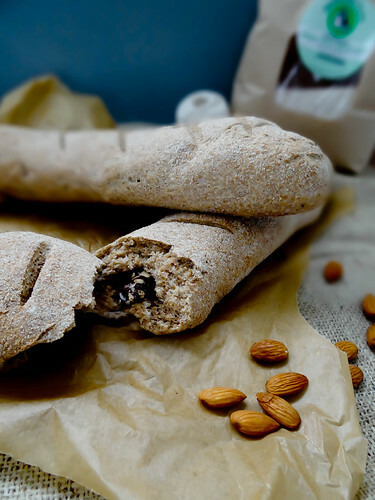 best enjoyed the day they are made- the sweet almond chocolate baguette is excellent in bread pudding after a day or two! Super delicious. I have been on a bread baking kick lately and can not get enough flavor combinations! And although I haven't quite mastered shaping a baguette, I haven't been deterred from putting loaf after loaf into the oven. Although not vegan, one of my favorites to date has been made with local goat cheese and sun dried tomatoes. I love your sweet style loaf and might have to bake up one of those this weekend. i love your sweet and savory baguettes! the chocolate one looks so light and perfect for a brunch! and i love that you used kristy's tapenade for the other one. it's on my to-make list, but i suppose a should bump it up a knotch! You do this too well! 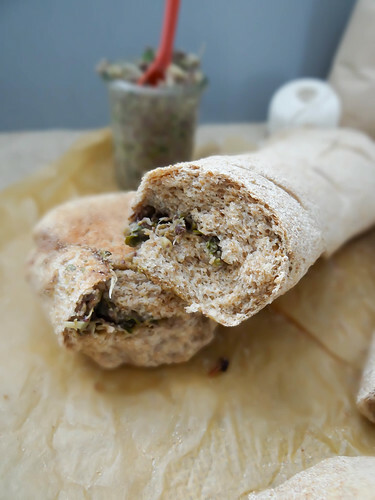 Love the idea of stuffing a baguette with either of these fillings! The chocolate one reminds me of a stuffed croissant, but without all the butter of course, and the savory one would make such a nice appetizer - its like serving crostini but with the topping already incorporated into the bread itself! I'll take both please. and with whole wheat flour nonetheless. Genius.